As Louisiana residents prepare for a possible hit from Hurricane Dennis, reporters are speaking with as many folks as they can. One older gentleman was in his backyard as a reporter approached and asked if he thought they would bear the brunt of the storm. The old-timer responded, "If there's acorns on the tree there's no hurricane. If there's no acorns there is a hurricane." The reporter asked the inevitable question and the answer was "there's only leaves, no acorns." Is it an old-wives tale or is it an accurate way to predict weather? We've all heard about squirrels stocking up in autumn in prep for a hard winter. But this is summer so one of my husband's first questions was were there acorns on oaks at this time of year. I learned that black oaks do have acorns throughout the year because they take two years to ripen before falling. White oaks apparently take upwards of 50 years before they even form acorns. But how do acorns alert us to upcoming storms? 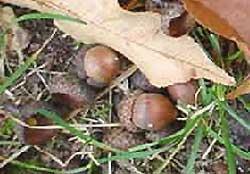 It's not so much that the acorns don't form or they fall prematurely, they have a little help from our animal friends. According to an article in the Taiwan News Online, animals have an early warning system for bad weather. The author cites several examples from tornadoes to the recent tsunami. So what of the acorns? Squirrels apparently gather them up saving for bad weather whether it be rain or snow. My guess then is that the old gentleman's acorns are stored somewhere while the squirrels watch the weather and wait. Oh, this article also answered a question I had last year about where the butterflies go as hurricanes approach -- they head for trees and sheltered rocky areas. Our thoughts are with our Gulf neighbors and their animal friends as Dennis approaches and we pray you remain safe. Happy Gardening.